STK Direct Drive motors have been designed for being integrated at the heart of servomechanisms with the aim to improve the performances of axis control of high torque motors. Thus, the use of ALXION’s Direct Drive frameless torque motors offers adequate solutions regarding the improvement of dynamic performances and accuracy and allows to address applications with demanding constraints on volumes and weights. Continuous torque from 8 Nm up to 2708 Nm continuous in natural convection depending on size and up to 6100 Nm in fluid cooling. Six external diameters from 145 mm up to 800 mm. Internal diameter from 56 mm up to 630 mm. 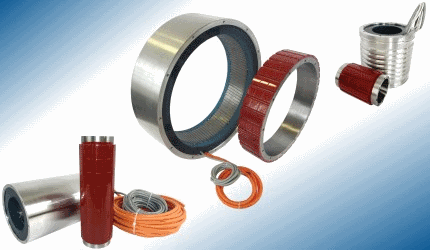 Various available windings from 30 rpm up to 1500 rpm depending on type. The range of frameless STK torque motors includes 6 sizes from 145 mm up to 800 mm available in different lengths per size and two standard rated speeds. They are particularly convenient for direct drive motors applications thanks to their outstanding compacity and accuracy.